If you want to take your company to the next level, then you need to put a system in place that becomes predictable and reliable. This system will attract more clients to your company, build your credibility with them, and get them ready to buy from you. All while you are off doing what you do best. So how does a system like this work? To put it simply, it’s a three phase process to (1) drive awareness of your brand and your services to your target audience, (2) qualify members of your target audience as Leads for your company, and then (3) get those Leads into meetings to turn them into clients or product sales. The real pros will add in fourth and fifth phases where you build in referrals, upsells and continuity programs as well. Does your target audience know that your company exists and what products and services you offer? If they don’t know about you, how can you expect them to work with you? Cold traffic is the people who we want to target that do not currently know who you are or about your products or services. They’ve most likely never visited your website before or signed up for anything that you offer. In order to drive awareness and get in front of the right people, you need to create content on your website that will interest them, educate them, and be relevant to your products and services. This content should be “problem aware,” meaning that it discusses the problem your audience is trying to solve. Since at this point they don’t quite know their solution options or who you are as a business, their intrigue level is focused on fixing a problem. You can then create a second step of content that is “solution aware” and discusses solutions for a particular problem that your audience has. But they must know what the solution options are if it’s going to draw them in. Once you publish that content on your website, typically on your blog, then you will promote that content. One of the best platforms for promoting content to your target audience right now is via Facebook ads. Now, while Facebook Pages don’t help businesses reach their customers anymore with status updates organically (without paying), Facebook Ads are one of the best ways to get your message to your perfect target audience. Since Facebook knows just about everything about everyone, you can target your audience very specifically. Remember though, that Facebook is just one medium to reach your audience, you can and should test and measure other channels based on your target audience. And once you perfect one, move on and add another one. Continue building your channels and your growth will start compounding to grow exponentially. So why are you paying to promote a blog post? This is the top of your funnel. It’s where you start to find out who is an interested member of your target audience. By tracking the people who click through to your blog content, you can then start targeting them for your next step of the funnel and earn more rapport with them. When they visit your blog post(s), they are showing you that they are interested in the topic that you are talking to them about. You are also showing them that you are a resource on the topic and are building credibility with them. These people are now qualified (and educated) enough to move on to the next step of their decision making journey. This is done through what are called Lead Magnets. When someone opts in for a Lead Magnet, they are getting a little sample of what you have to offer. It’s the next step in earning their business by getting them to Know, Like, and Trust you a little bit more. This also means they’ve given you permission to communicate with them in a more one-on-one way with email. And email is where you are going to build your rapport and influence them to do business with you. Now that you are communicating more intimately with your website lead through email, it’s time to build the personal rapport and earn a meeting. 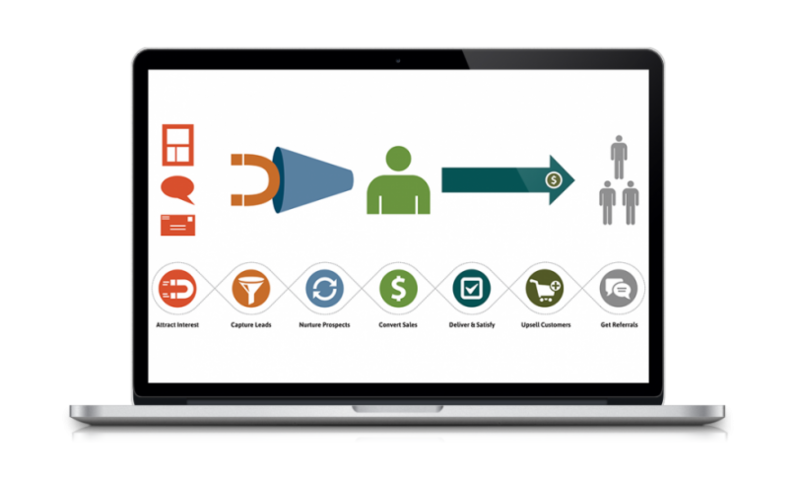 Using marketing automation, this entire communication process can be done on autopilot. Don’t worry about needing to manage sending emails out every day to new sign ups. What are the key pain points that you solve for your clients? What makes your clients have a great experience? What are the key benefits that your clients receive when they work with you? This is where you start showing off your real skill set and convincing Leads to want to hire you. The best way to do this is through an interesting storyline, and told through the eyes of a client. That way everything that you are telling a story, or parable, and not giving the hard sell that is a turnoff for so many people. These parables should be told in a way that resonates with your ideal clients and engages them to stay interested. When they learn how great your company is at helping people just like them, they’ll be ready to come in to talk about doing business together. That’s where your sales team takes over and closes new business. The best part about having a system in place, is that now you have a trackable process to see what’s working and what’s not, and where to test making changes for improvement. Building a successful funnel is a simple process, but one that takes time and hard work to perfect. Make sure you are monitoring performance and making necessary adjustments. Without a system though, you wouldn’t have anything to track, test, or change in order to grow your firm predictably and reliably.